Bulgari surprised many watch industry observers when it introduced its Diagono Magnesium last year. The Swiss watch manufacturer with Italian design at its heart was not the first timepiece maker to come to mind when considering high-tech digital electronics. But at Baselworld last year Bulgari made the leap to connectedness with working models early in the calendar year, months before we saw functioning connected watches from TAG Heuer (which also shares LVMH as the parent company), Movado and others. We sat down with Fabrizio Buonamassa Stigliani, Bulgari’s senior director of watch design, for a look at the thought process at Bulgari that lead to the Diagono Magnesium. Buonamassa Stigliani, a former Alfa Romeo automotive designer, flatly stated that the watch is 100 percent Swiss made, and it’s not a gadget. Click on the video link here to find out exactly what the Bulgari Diagono Magnesium is and how you can store your private data in luxury. 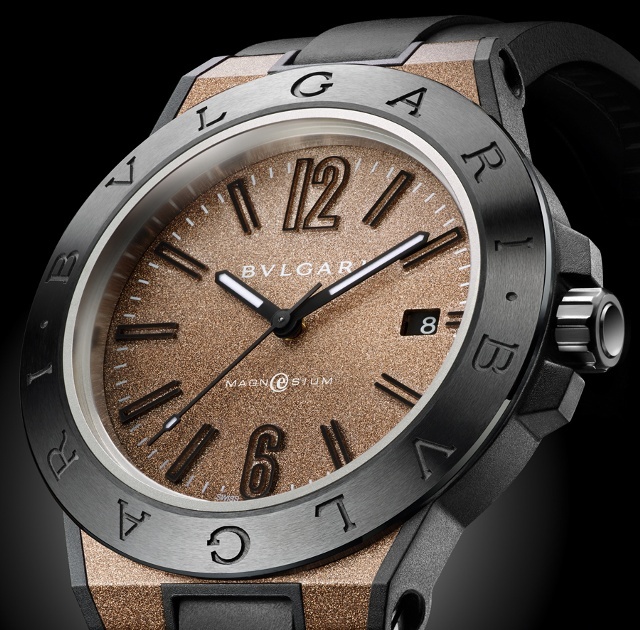 Bulgari’s Diagono Magnesium not a smartwatch, but it is intelligent, Bulgari says. It’s a genuine luxury watch complete with a self-winding movement, a beautifully made dial and a 41mm magnesium and ceramic case. Hidden inside is technology from Wisekey, a Swiss company known for digital security and storage, which has made a cryptographic chip and invisible antenna used to secure NFC technology (Near Field Technology). The user can harness this technology via Bulgari’s own app to store passwords and any other data inside this vault. Simply place the Bvlgari Diagono Magnesium and smartphone close together and the user can access the vault, which offers banking level security, according to Bulgari. Where does the information go? To a Swiss military bunker somewhere in the Alps. If the watch is stolen, Bulgari says the data can be automatically destroyed, making it inaccessible to anyone else. But if the watch is recovered, the data can be restored. And in the case of a luxury brand like Bulgari, the application will enable clients and distributors to enjoy a great many advantages: the technical information pertaining to the watch and user manual, certificate of authenticity, activation of the guarantee, automatic registration with the Leonardo da Vinci Club, traceability of all operations conducted on the watch.